For many people, their home is not just their castle, it is their biggest investment, as well. ​Over time, your family and lifestyle can change, and the house that once seemed perfect is just not a great fit any longer. Seize this as an opportunity to convert your house into the home of your dreams. A sure way to transform your living space is with creative applications of concrete. In the world of renovations, concrete is one of the hottest trends today. This largely due to advances in technology that make creating with concrete an affordable and attractive option. The days of tired gray concrete are gone. Today’s concrete creations add stunning beauty to the durability of concrete; making it an ideal material for indoor and outdoor restorations. 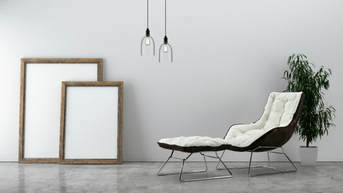 In fact, using concrete in your home revamping can significantly transform your living space. Alfresco entertaining is more popular than ever, and more families are moving meals and family time outdoors. Imagine having a space dedicated to enjoying the outdoors. Not just any space but a space that is as beautiful as it is durable. Decorative concrete can easily make this happen in your yard. 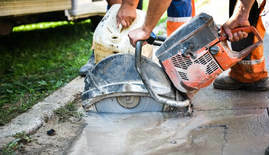 Things like stamping, the addition of aggregates or colors, and skillful concrete finishing can turn a boring patio or underutilized piece of lawn into a vibrant and vital gathering place for family and friends. Additionally, concrete can be used to make permanent outdoor cooking areas, fire pits, and custom walls and walkways. If you can imagine it, there is a great chance it is available in concrete. ​The variety of finishes available for concrete is extensive. Adding colors and stones, buffing to a mirror finish, and adding unique textures and patterns are all excellent ways of beautifying your home. Concrete is relatively easy to care for, and concrete surfaces actually improve their appearance as they age. Once the surface is sealed, using a damp mop or cleaning cloth is sufficient for everyday care. Spending less time cleaning gives you more time for enjoying your loved ones. It makes sense that having a place to entertain with ease makes you more likely to invite guests to your home. Think about how much enjoyment your family and friends would get from the addition to or upgrading of a backyard swimming pool. Concrete is an ideal building material both for your pool and the pool surround. You can take advantage of the glorious weather and feel like you and your family are on holiday without leaving your yard. Installing a sleek, modern concrete pool will add untold fun as well as monetary value to your home. When it comes to significant renovations, the do it yourself approach may not your best option. It is a safer and smarter idea to put major projects into the hands of experienced professionals. The experts at Concrete Crib are more than qualified to turn your vision into reality, transforming your living space in the process. They years of experience, are family owned and operated, and have hundreds of brilliant projects you can reference. Customer service and attention to quality and detail are the hallmarks of Concrete Crib. They are simply the most experienced and best qualified concrete specialists around.